So I know I've been lazy again not sticking to my blogging schedule, but I have many great posts for you guys coming soon! I know I've bombarded you with monthly favourites last week which I had to catch up on, and they have been rushed, but let's hope you guys enjoy this post! So, last month favourites are all beauty related. 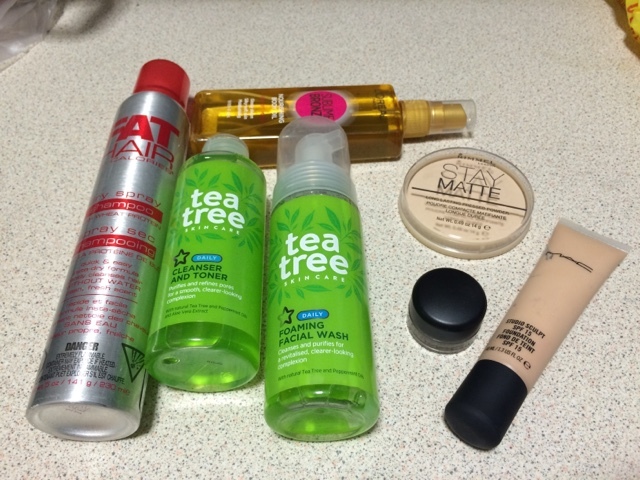 There's the FATHAIR dry shampoo, L'oreal's Sublime Bronze moisturising oil, Superdrug's own brand Tea Tree Skincare, Rimmel's Stay Matte powder, and MAC's Studio Sculpt foundation and Fluidline brow gelcreme. The first product I am going to talk to you guys about is the FATHAIR dry shampoo. It was a great find as me and my mum found it in Poundworld so quickly grabbed one each to try it out, especially as it retails at £5.99 in superdrug. I was disappointed with this product at first as I didn't think it gave my hair much volume, nor the 'cleaninless' if that's even a word? I thought it was really bad compared to my all time favourite Batiste, however I started using it more to see if maybe it was a bad hair day I experienced, and I was right. This product is amazing, it lifted my roots up and made my hair look 3 times bigger than normal. It also made my hair look less greasy after not washing it for 1-2 days. I highly recommend it, and hope you guys can find it in Poundworld like I have! The next product is L'oreal's Sublime Bronzing oil. It was also a great find in Poundworld (honestly, it is probably one of my favourite shops now!). It made my skin feel very soft and not at all greasy. It's a great tan enhancer as it moisturises the skin and preps it in order to keep fake tan on for longer. I combined it with my MakeBelieve fake tan and the results were fantastic. I felt really good about how my skin looked, especially as I'm naturally very pale, it was a nice feeling! I walked into Superdrug to find myself surrounded by lots of offers and I came upon this great Tea Tree range with the products being on offer 2 for £4. I've never tried Superdrug's own brand skincare products so thought I'll give it a go, especially as I was in need of some new spot treatment products. The cleanser/toner is very gentle on my skin and makes it feel soft and fresh - exactly what I was looking for. It cleanses spots and blackheads well getting rid of excess oils, leaving the skin feeling tight and smooth. On the other hand, the foaming facial wash was trickier to use as the foam started evaporating as soon as I put it on my hand and felt quite odd putting it on my face, but the results were unexpectedly good. It made my skin feel very clean and fresh, but I did have to use it twice in one wash in order to get rid of all oils and dead skin cells. I would definitely recommend both of the products to anyone who's suffering with bad skin, as they are affordable and good value for money. Rimmel's Stay Matte powder was something I wasn't too sure about buying as I've had it before when I first started wearing make-up 5-6 years ago and I didn't like it very much, however I recently repurchased this item as it was on offer in Boots for 3 for 2 and because I needed a spare powder to keep in my bag rather than having to take my huge Chanel loose powder as it goes everywhere if I keep it in my bag! I chose the transparent shade as I don't like high coverage powders and only wanted to use it on my T-zone to reduce the appearance of oil on my skin and it does a pretty good job. It retails at only £3.99 and is totally worth getting as it makes my foundation stay on for longer and reduces the appearance of oil on skin. I recently ran out of my BrowZings from Benefit and I was really upset! Even though it lasted me for nearly 2 years and was an amazing product, I decided to go for something new just to try it out. I went into my local MAC store and asked for help with my brows and got told that the shade 'Dirty Blonde' would suit me best. I agreed with them at the time but now that I've changed my hair colour back to grey I don't think it suits me that much so I go over it with an ashy eye shadow. However, It is very easy to apply and lasts forever once it's been applied properly. I do like to go over my eyebrows throughout the day to make them appear slightly darker and neater if I've had the same make-up on for a whole day. I would recommend this product for people who know how to apply gel products with a brush and have a steady hand as I struggled with the application for the first few days of having this products until I watched a couple of YouTube tutorials. Last but not least, MAC's Studio Sculpt foundation in NW15. I have always been a big fan of MAC's foundations and this time I wanted to go for something moisturising rather than mattifying and was advised to go for Studio Sculpt. I was very excited to try this foundation but once I got home I thought I made a terrible decision as it didn't sit well on my face and kept smudging in places and didn't cover any redness etc. I was very disappointed with it until I started using a different technique while applying this product. I use a different foundation brush and then dab powder onto my skin and add a bit of Fix Plus spray to keep my face looking fresh and make-up last longer. I would recommend this foundation for people who have normal to dry skin and mostly with 'perfect' skin aka zero spots as it doesn't look great on my skin (I have many post acne scars). Have you tried any of these products? What are your October Favourites?